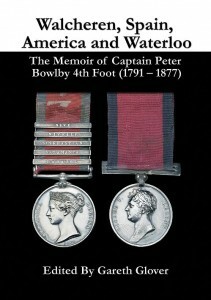 The 4th (King’s Own) Foot has to date no known memoir of a soldier from its ranks during the Napoleonic wars excepting the biographical and understandably biased book by Archie Hunter based on the few short letters of Lt. Colonel Charles Bevan, which seeks to absolve him, slightly unconvincingly, of any blame for the Almeida debacle. Because of this the service of the 4th generally goes unrecognised. This is grossly unjust, with the regiment being involved at Copenhagen, Walcheren, the Corunna campaign, the Peninsular War from Badajoz to the end of the war, the 1814 campaign in America and the Waterloo Campaign. Luckily, we finally have a fine memoir from the regiment, from a copy which is held at the National Army Museum, reference 2002-02-729 and I am very grateful for their permission and the Right Reverend Ronald Bowlby to transcribe and publish it. Peter Bowlby was born the third son of the Reverend Thomas Bowlby, Rector of Tudhoe and Perpetual Curate of Pawshaw in Durham and Eleanor Elizabeth Salvin. He appears to have been born in late 1791 but baptised in March 1792, which has caused some confusion with his birth date. Peter joined the 4th (King’s Own) Foot on 7th June 1808, rising to lieutenant on 31st of May 1809 and to Captain on 23rd October 1824. He served at Walcheren, Ceuta, the Peninsular War (seeing action at Badajoz, Salamanca, the retreat from Burgos, Vitoria, San Sebastian, the Nive and Nivelles, it is unclear why he did not receive a bar for Vitoria), Bladensburg and the burning of Washington and New Orleans, before returning to Europe just in time to participate at Waterloo and in the subsequent march to Paris. His memories are sometimes light of detail on specific combats, but his notice of numerous interesting asides throughout the memoir give an excellent idea of life as a junior officer during the Napoleonic wars.